“As kids we were bought up to leave a place better than when we arrived.” says Brett. 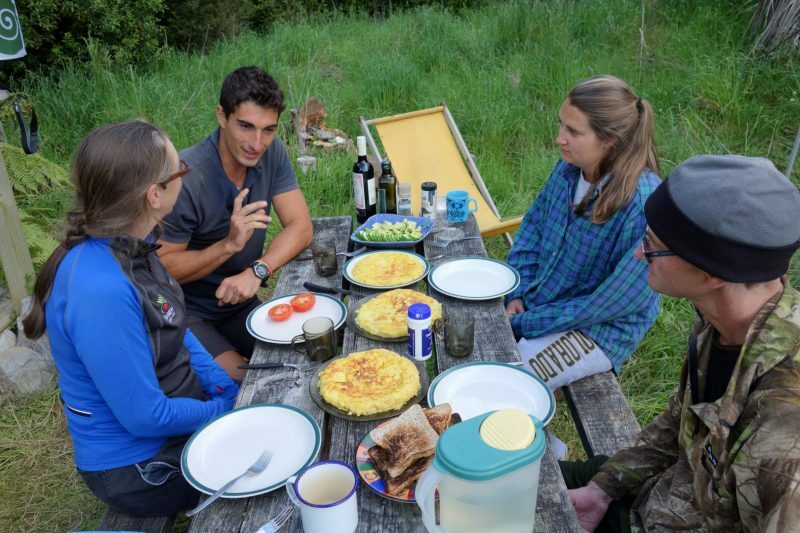 Whether it be tidying a tramping hut, filling a wood shed or picking up rubbish on a beach, it’s an outdoors etiquette that most Kiwis follow. That’s partly why New Zealand is such a beautiful country. So it’s natural that Brett Whiteley and Helen Spring would turn their attention to climate change, because the climate has such an impact on the outdoors they love, particularly the snowy mountains and glaciers, our coastlines and rivers. 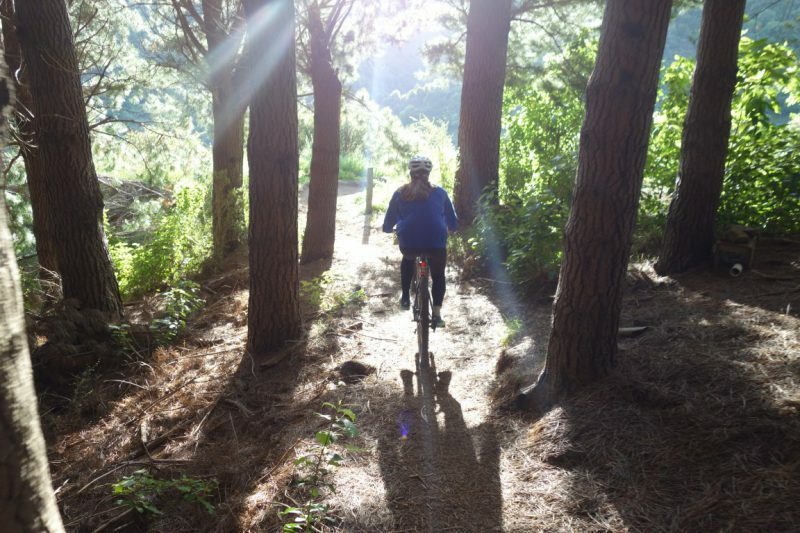 Brett and Helen often mountain bike through Project Rameka to Takaka in Golden Bay. The forest there is owned by a charitable trust for the purpose of growing trees to absorb carbon dioxide from the atmosphere. And it now has three popular tracks through it that were built by volunteers. But the trust recognised that the forest offered even more potential. It entered the forest into the Permanent Forest Sink Initiative (PFSI). As part of the deal, the trust has agreed with the government to grow trees to absorb carbon dioxide and never log the forest. In return, the government gives the trust carbon credits, which it can sell. The charitable trust sometimes sells carbon credits to people like Brett and Helen so that they can offset their carbon footprint. Here’s how it works. Their footprint was only 8 tonnes, which is pretty good. Then Brett approached Jonathan from Rameka Charitable Trust to cancel 8 tonnes of carbon credits, which cost $200 ($25/tonne). That then meant that Brett and Helen were carbon neutral for the year. Awesome! The charitable trust doesn’t have any management costs (and the government doesn’t charge any kind of tax on the transaction as it wants to encourage New Zealand to meet its international climate agreement targets). So the trust puts all income from carbon credit sales back into the project. 100% of Brett and Helen’s $200 will be used to enhance the forest at Rameka by looking after trees and controlling pests. But Brett and Helen went even further. They decided that they wanted something tangible to show for their efforts to ‘give back’. So they decided that they would buy a tree for every report written for Brett’s business (West Wind Projects). That equates to around 100 extra trees a year planted at Rameka. The end result is that Brett and Helen are no longer part of the climate change problem; they are part of the solution. And the forest at Rameka will be bigger and better every time they ride through it. 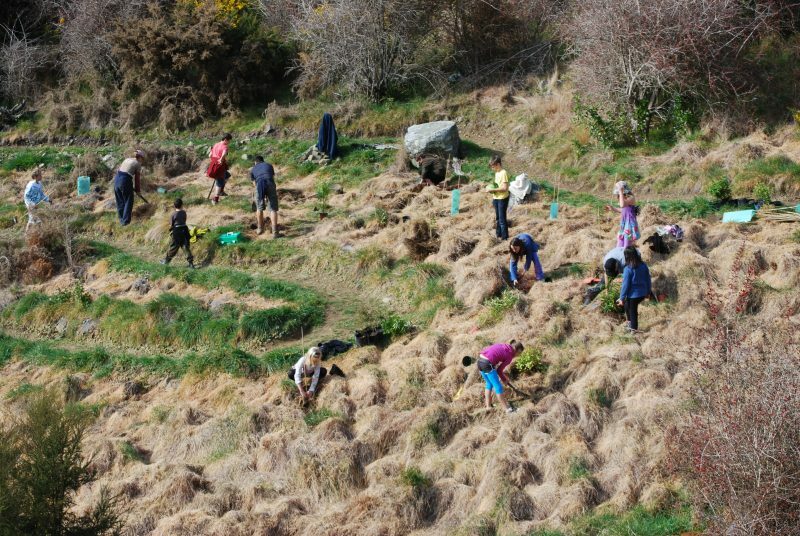 Thanks to https://westwindprojects.co.nz/ for supporting the environment. 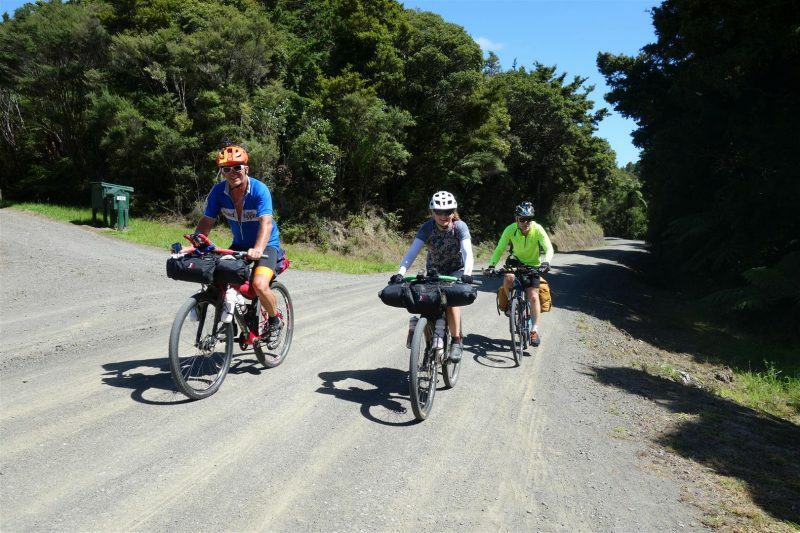 Brett and Helen and a friend riding the Tour Aotearoa in Northland. Rata was in flower for the first time at Rameka in a very, very long time (probably since the forest was burnt off in the 1970s). 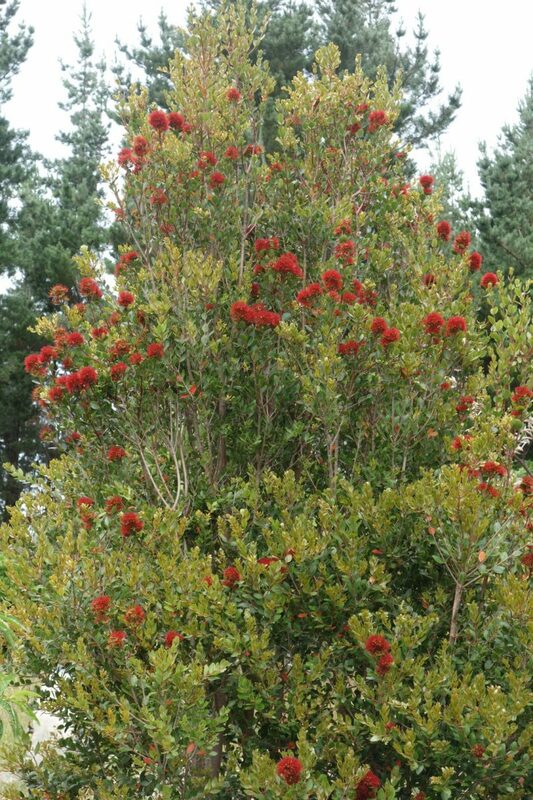 This rata was planted in 2009. 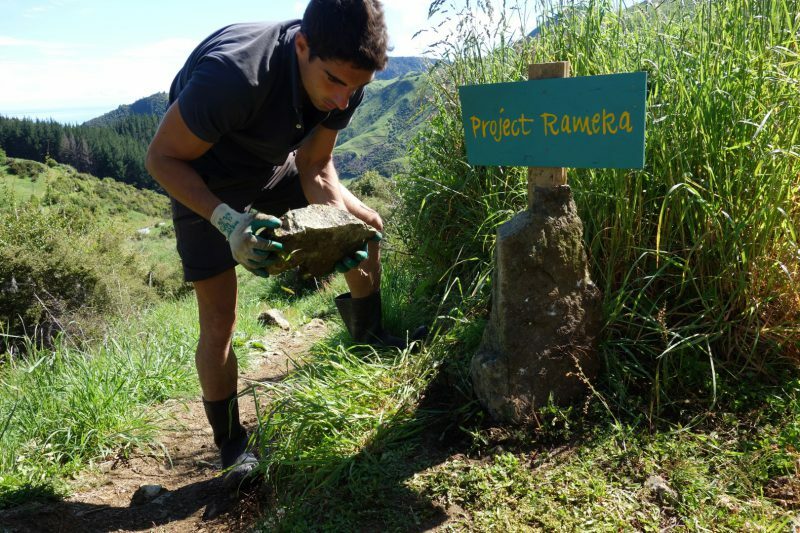 Many thanks to Project Crimson for the hundreds of rata planted at Rameka over the last ten years. 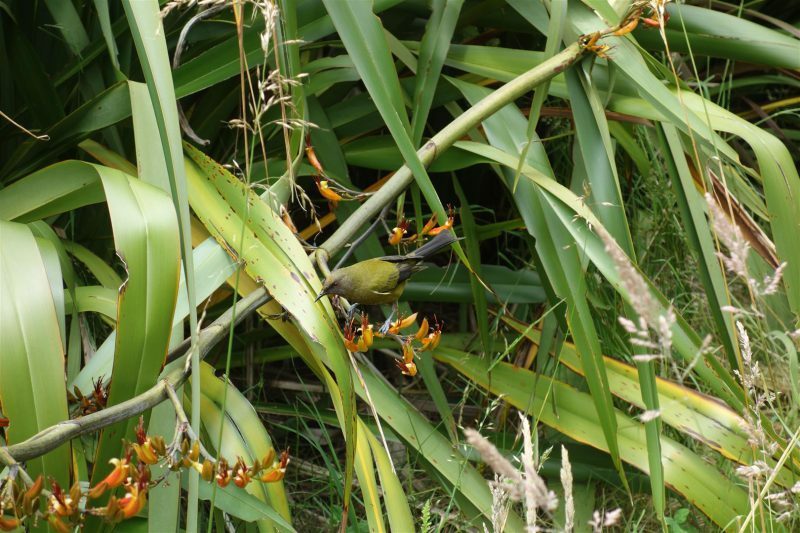 There were two bellbirds feeding from flax that we planted in 2011. Just wrapped up a brilliant week at Project Rameka. Great people, and lots done. After heavy rain we cut back all vegetation hanging over Great Expectations and The Odyssey, as well as digging out a lot of the ruts. The other change that people will notice is that we painted 10 new signs and installed them. 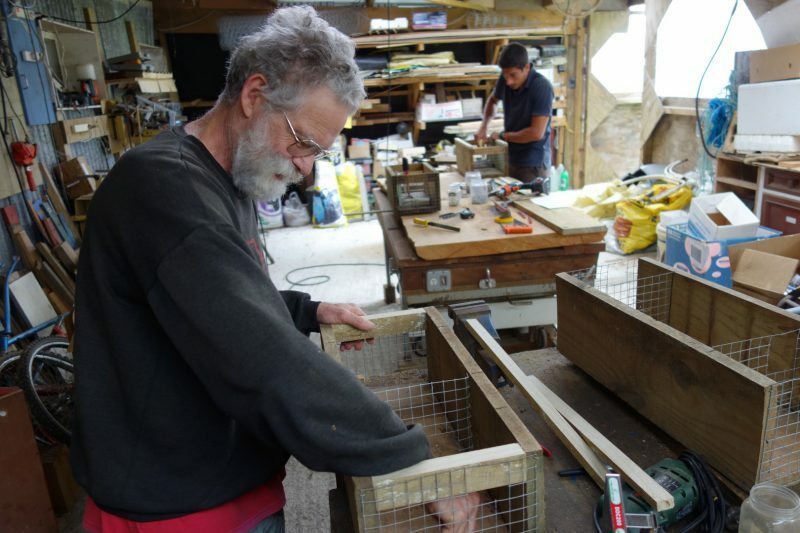 We then refurbished 12 stoat traps that DOC kindly donated, and built boxes for 10 new traps to go along the Rameka valley. The final job was to monitor and release the trees planted last August. The weeds and trees are growing like crazy this spring! And finally, thanks to the magic of photosynthesis, the trees at Rameka sequestered 26 tonnes of carbon dioxide during the week we were there. Charlotte test riding Great Expectations. From this we wrote a Track Prescription outlining 20 difficult spots to work on. Ignacio installed one of the new hand painted signs at the top of Project Rameka Inc. We painted and installed signs at every track entrance and fork at Rameka. 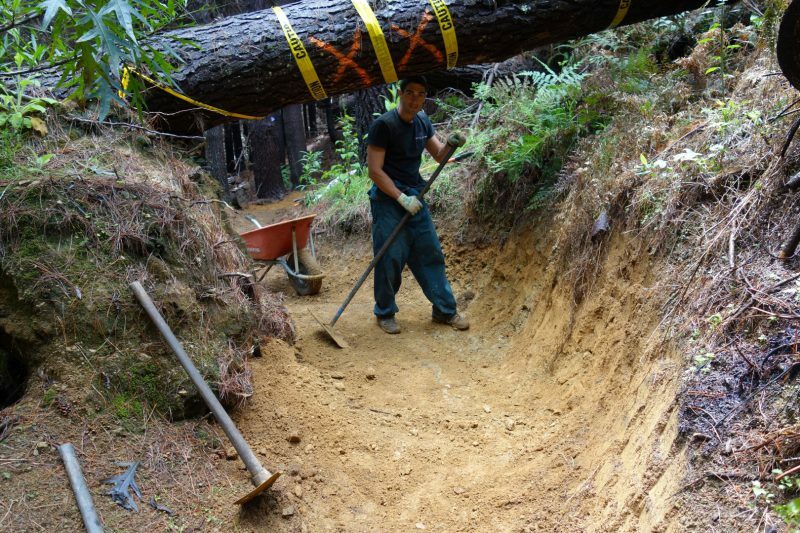 Ignacio dug out 8 wheelbarrow loads of soil from under the ‘limbo trunk’ to provide enough room for tall riders. Andy, Simon, Charlotte, Martin, Bronnie, Ignacio, Jonathan and Marie, having a lunch break on Great Expectations. Awesome progress made to this point in only 2 hours! 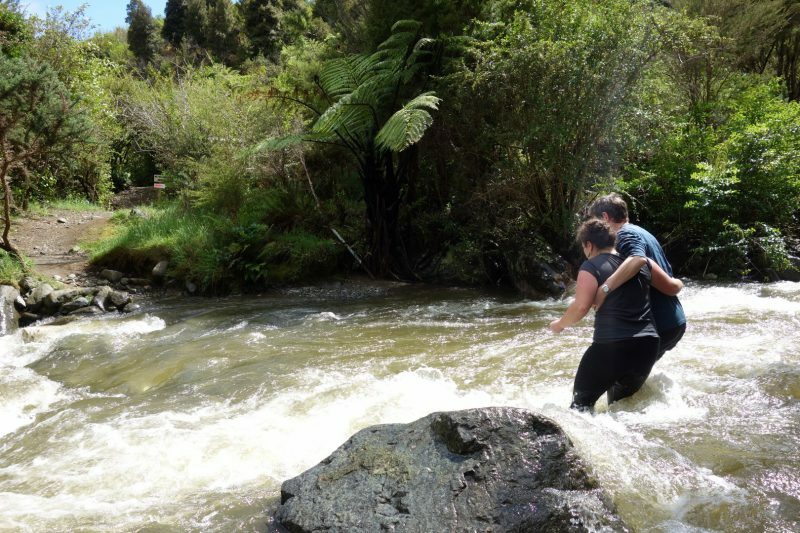 Perrine and Jonathan attempt to cross the Rameka Creek, but had to back out. The strong flow was just about to take them down. This is where the new bridge will be built. 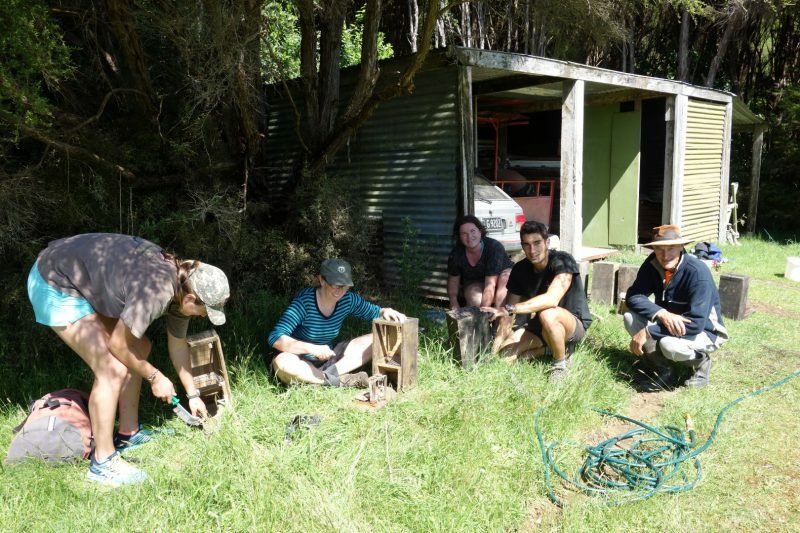 Charlotte, Bronnie, Perrine, Ignacio and Jim refurbishing DOC200 stoat traps to place on the historic Rameka Track. Albie and Ignacio modifying old trap boxes to fit new trap mechanisms. Ten of these were then installed along the Rameka Creek Valley by Paul Kilgour who has since caught stoats and rats. Dinner time at Rameka, Catalonia style. Next month will be a busy time at Project Rameka. Come and join us if you can spare the time! On Sunday 13 November we will be holding a ‘Test and Tickle Up’ work party on Great Expectations. The goal is to identify the spots that are currently unrideable for Grade 2 riders and fix them. So if you are a Grade 2 rider, please come along and test the track for us, then help us make it work for you! Meet at the top of Great Expectations, at 10am on Sunday. We will have some tools, and some food for a picnic lunch. During the week of the 14-18th November, Marie and Bronnie will be working with US interns Jane and Charlotte to paint new signs – one for every track intersection in the project. These will be popping up to help visitors know where they are heading. On Wednesday afternoon, 16th November, Jonathan and Martin will be leading a work party to uncover more of the historic Rameka Track. 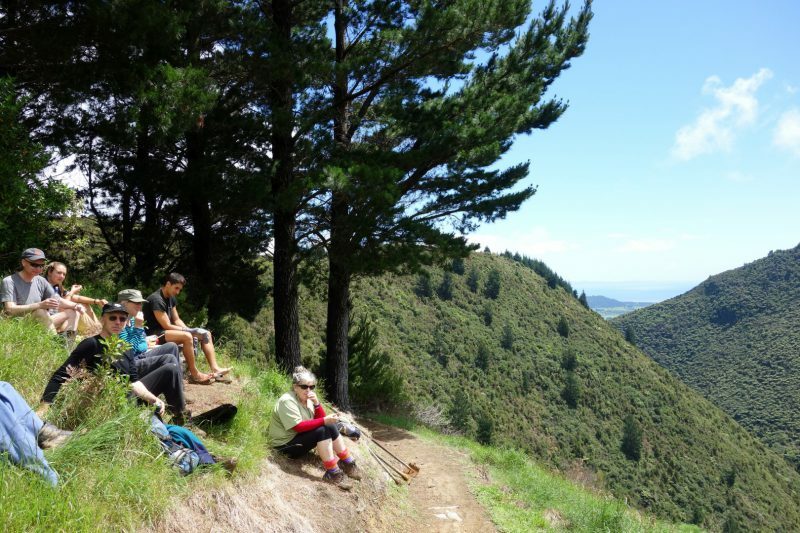 We will meet at the Totara Carpark at 1pm, and head up the escarpment to the Scrub Face. It’s a fair walk in now, and the views are impressive. We are also on the lookout for a couple of Trail Pixies to give some TLC to The Odyssey. It shouldn’t take much – just a bit of vege trimming, and perhaps removing the odd rut here and there. If you are able to spare the time, please contact Jonathan (jonathan@kennett.co.nz) or Martin at the Quiet Revolution Cycle Shop. A heartfelt salute to all those that planted trees last August (and previous years). They are growing incredibly well, and sucking up carbon dioxide in the process. Just a reminder that Good S@#T Happens when good people make it happen. P.S. Thanks to all the people who have been beavering away on the tracks over the last few months! Many thanks to Fil and Albie Burgers, Paul Kilgour and Andrew McLellan for their great work on the trap line. Trapping rats and stoats is a matter of survival for the native birds at Rameka. Over the last 12 months, they have caught 19 stoats and 30 rats. This has provided a much better environment for birds, and we can now confirm that there is a family of weka resident at Project Rameka! 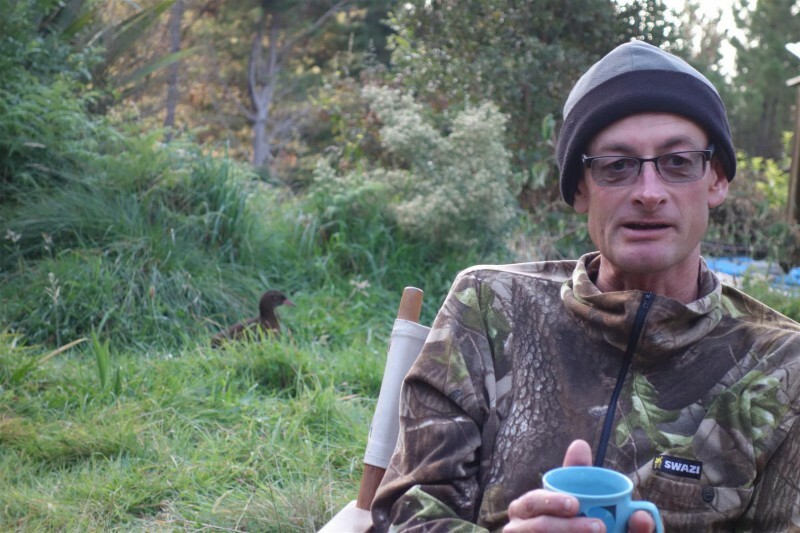 Matt the hunter is stalked by a resident weka. If you’ve been wondering why you hardly ever see a possum at Project Rameka anymore, that is because Matt Shoult fills possum bait stations twice a year. 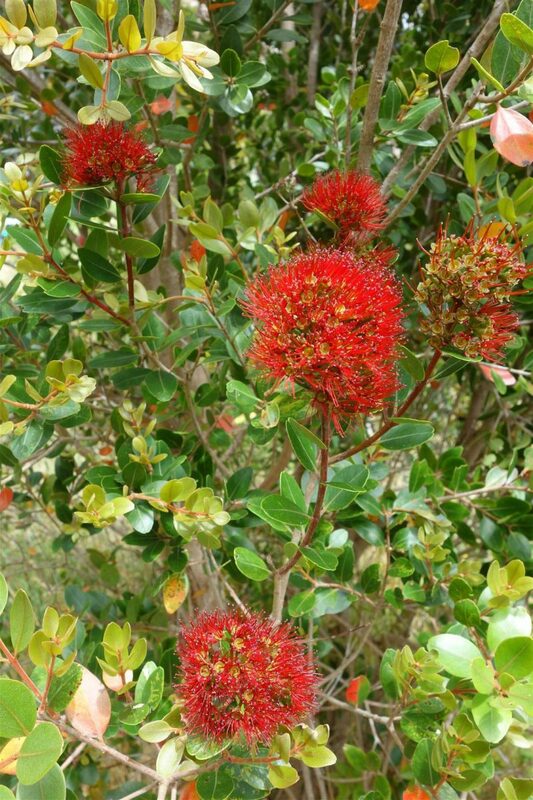 The native plant and animal species are really thriving as a result. The growth is phenomenal. Matt has also teamed up with Project Devine to wipe out some huge infestations of banana passionfruit on the new block of land. It’s scary how much forest area those vines can smother. Matt has also been fast to react to reports of wild goats and pigs, keeping numbers as low as realistically possible. (15 and 19 down respectively) Thanks Matt.